Hi everyone, this is Moumouu and welcome to my very first build. Been playing sunder for a while but it's the first time i managed to destroy everything(end-game content) while being super tanky. Good Uniques to level, if you can't get them just get the best one-handed weapon you can or level with a 2-Handed and respec when you feel like it. I used Molten Strike and Cleave to reach lvl 12, then switch to Sunder. Gloves - Lochtonial Caress gives charges and good attack speed. Belts - Meginord for DPS, Perandus blazon if you're missing some stats and Wurm's Molt for Mana and Life sustain. You can take ''Blood in the Eyes'' last if you feel the need for more block early. Ruby Flask instead of Amethyst. Just dodge flameblasts and focus purple arm copy. Standard Flasks. Care for Izaro and Argus if you dont have Flasks/Charges up. Two anti-bleed HP potions. Bosses hit hard, try to keep charges up. Two anti-bleed HP potions. Care for 3rd wave of minions (Chaos damage). Ruby Flask instead of Amethyst. Care for ''Phoenix Firebomb''. Topaz flask instead of Amethyst. Don't stay in ''cave-in zone'', face-tank it. Saphirre Flask instead of Amethyst. Thanks for the thread :) I'll be waiting for more information on useful items to use while leveling. I've been searching around the forum and there isn't much on other threads with similar Sunder builds. Currently level 15, Sunder's fun! I hope I reach a high level. I'm interested in playing this build. Will I be able to do all the endgame content with this build? Also does this build have any mana issues? 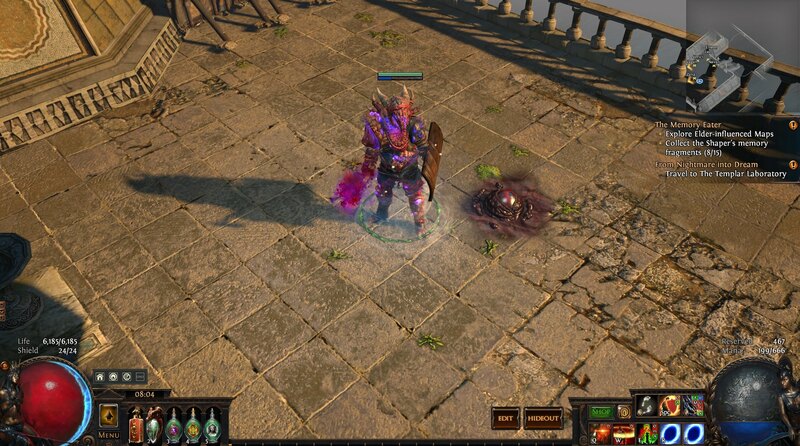 Right now i'm doint Corrupted T15 and it's going easy, Normal Atziri and Uber Lake is cake too, will keep you update on higher content. For mana, just using one Node near Iron Reflexes is enough, but map mods like no leech/no regen, you will have to use your mana efficiently. Or you could just use the unique axe Soul Taker. Awesome guide and build. Love the bloody explosions! Also can you share a Path of Building link for your char? Tempest shield dont have to be in CWDT can be casted manually but i guess immortal call is usless for you. Got any videos by chance? How do you think this would be on HC? True, i was thinking about removing it and using enduring cry on CWDT setup to get the increased duration and link a enlighten with auras instead. Still not sure.